Creating a simple starter can help assure viability of your yeast prior to brew day, it can also work very effectively to increase the yeast cell count so that you do not under pitch (too few yeast cells) your brew. Under pitching can stress your yeast, impede a healthy fermentation, increase lag time and lead to off flavors. Create your starter anywhere from 24-72 hours prior to pitching. First, check our Yeast Pitch Rate and Starter Calculator. In general, for a typical ale – 11 grams of dry yeast is enough. With liquid yeast, a starter is recommend to hit the pro pitching rate (which you want). When brewing a beer with an OG of 1.060 or greater – ALWAYS. When brewing a Lager beer – ALWAYS – the colder fermentation temperature requires a higher yeast pitching rate. A 1-2 quart starter has always been sufficient for my five gallon batches of Munich Helles or Oktoberfest. If your yeast is old or past its expiration, stepping it up with a starter is safer, but you should always try to use the freshest yeast possible. Liquid yeast is pretty much completely dead after just under 5 months. Yeast pitch rates is a complicated subject, click here to read our article Yeast Pitch Rates Explained. Bring 1.5 quarts of water to a boil in the sauce pan. Measure 3-4 oz of DME and introduce this to the boiling water, stir well, boil 10-15 minutes. Remove from heat, placing lid on the sauce pan. The boiling process should have reduced the volume to ~1 quart. Cool the starter wort in a shallow, cold water bath or in the refrigerator until it reaches the target fermentation temperature of the beer you will brew with it. Once cool, pour the starter wort into a sanitized flask or carboy. Secure a piece of tin foil on the opening of the flask or carboy and shake vigorously to aerate the wort. 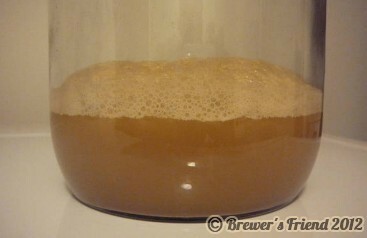 Pitch the yeast (add yeast into the flask / carboy containing the aerated wort). Seal container with a clean piece of foil, or a cork fitted with an air lock. Place starter in a dark area where it can maintain the proper temperature for fermentation. When you are ready to use the starter you can swirl the flask/carboy to rouse the yeast and pitch the entire volume of the starter into your awaiting wort. Likewise, you can chill the starter after fermentation to facilitate the settling of the yeast, on brew day decant the “beer” from the flask/carboy and pitch only the yeast slurry left in the bottom. The starter should start bubbling in about 24 hours and can be pithced into your batch 24-48 hours later (ideal), or up to a week if you refridgerate it. Ive read over this several times, and I think I am correct in saying that nowhere do you specify exactly when to pitch the yeast for the starter. I am assuming it is after aeration and prior to placing in a dark area. Good catch, yes that is absolutely correct. I would say you need a starter for beers over 1.040 not brews starting at 1.080… If you pitch 1 smack pack into 1.075, you have grossly underpitched IMO. Somewhere around 1.060 is where I draw the line personally. I’ve made several batches with OG between 1.040 and 1.055 without any problems using one white labs vial or smack pack. I appreciate your info. Thanks very much. I have been using starters just like you mentioned and I have been very successful. However, I have been using starters for all my brewing OG which is anywhere between 1.040 ~ 1.054. I don’t decant, don’t see the bother. I just pitch the whole thing and get more beer! I’m going to keep doing it this way – leave what’s well enough alone. If it works don’t fix it and besides it confirms the quality of my yeast. My fermentations’ have started right away usually within 8 ~ 12 hours. My brewing experience has been self-taught from reading but mostly by doing. It’s nice to know I’m on the right track. Again – Thanks! I’m glad you find the site useful! I have decanted at times, and on other occasions poured the entire starter. It depends on how settled the yeast was in the starter, how full my primary fermenter is, or how careful I’m being about style and quality. More beer is always good but pitching the entire starter, instead of just the yeast will dilute the color and bitterness by up to 25% depending on the size of the starter (25% would be a 1 gallon starter for a 5 gallon batch, assuming the starter is unhopped). DME is what I use to create my starters, and I have noticed a twang from it in my earlier beers compared to my all grain creations, so I tend to lean towards decanting. Any experience with starters and dry yeasts? I have had problems twice now with Nottingham. One was a recall batch, the other wasn’t in that recall but it acted just the same. The recall one required me to pitch the wort onto a yeast cake due to no activity within 72 hours. The second one started a krausen at 67 hours and finally started air lock activity the next day. I have 3 more packets of Notty. I was thinking a starter is in order to avoid more lag time. I’m guessing the yeasts in the packets are damaged so the pitching rate for live yeasts in the packet is very low so probably a small starter is needed…but what if the next packet has no issues? A large pitch rate in a small starter…issues? I was actually thinking a bottle of Malto Goya with a packet pitched in it. It sounds like the dry yeast you are using might be old. That would explain the lag. Using a starter is a great way to test the viability of the yeast without risking an entire batch of beer. Over pitching yeast is not a worry unless you are talking about pitching 2 gallons into a 5 gallon batch. If you put a healthy pack of dry yeast into a 1/2 gallon starter, you will be right on target, in fact this is the recommended procedure for high gravity beers. When I have questionable yeast (old, been in the fridge awhile), I always make a starter. Not old yeast. 2010, 2011, 2012 dates. Nottingham had problems with the stamp that did those dates. Guess it punctured the packets slightly and air got in. No official recall but on one specific batch, they will send new packets in place of sending them one back. I’m guessing the high OG probably compounded the problems with the Nottingham, but no excuse for the Pale Ale. How long can you keep a starter in the fridge and still have it be healthy to pitch? I only brew maybe twice a quarter. I’d like to start saving money by reusing my yeast but is this method only good if you’re constantly brewing? I would bet the starter is okay for a week or so. This includes some information about how to bottle and save your yeast. I’ve been successful with that after a couple months. I’m about to try it with some second generation yeast that has been in the bottle for about six months. I will create a yeast starter as described in this post to make sure it is still viable a few days before brew day, otherwise I’m out $7. Is it bad if you create too large of a starter – assuming that you decant off the liquid to not affect the taste of your beer? For a 5 gallon batch, most pitching calculators recommend around 2 vials of white labs or wyeast. I am currently experimenting with doing starters for everything including my ales. I decant the liquid above the yeast in my starters because I want to keep the beer as high quality as possible. Over pitching is generally not considered a problem, and most people probably under pitch. I’m late to this post but had a question nonetheless. I made a 2L starter with a Belgian Trappist yeast (WLP500). Wanting to bring the gravity up to match the impending wort (~1060 @ 70 degrees), I made a typical 1L starter. But after 24-36 hrs, I added add’l sterile DME wort. After 3-4 days, I added a mixture of brown and corn sugar. The yeast really took off and had vigorous CO2 production and growth. On day 5, I brewed a raspberry Belgian, had great efficiencies and aeration, and pitched. All seemed great but no fermentation. Nothing. The room was warm during the first 2 days (>=75 degrees) and fearing the excessive warmth, I sealed off the fermenter and moved to a cooler room. Prior to this, however, I swirled to rouse in the hopes of encouraging activity. It’s been several days and now wondering what to do. Thoughts? Sorry to hear the brew did not take off. It sounds like you know what you are doing and did everything correctly. When you pitched the yeast, did you do the entire contents of the starter, or just decant? It is possible the yeast you wanted to pitch was left behind in the slurry. Another thing that occurs to me is the temperature of the wort when you pitched, was it cooled down below 75F? If all else fails, pitch some fresh yeast (buy a vial or two at your local home brew store, or even use dry yeast if you have it on hand). If that doesn’t go, then you must have an infection of some kind. I have never read anything about overpitching… Remember, the whole point of pitching a starter is to overwhelm any other infectious organism that might be present. Just make sure that the starter you make isn’t contaminated before pitching (just make sure it doesn’t smell bad or have an off color). Hi, I need a dried yeast for premium Beer production ( wort sp. ge. of 1.040 to 1.060) in large scale. Would anybody suggest which strain is favourable. Can you make a yeast starter with table sugar, or is there some reason it is necessary to use DME? DME is better suited to the yeast, and will be what they ultimately live in during primary fermentation. Table sugar is not as nutrient rich as DME. Raising them on table sugar, then switching them to DME can lead to poor yeast performance later on. I would stick with DME for yeast starters. What if I used corn sugar (priming sugar/dextrose) instead of dme? I brew all grain and have always started my yeast w DME but I’m out and don’t feel like running to the brew store. Will it help if I pitch nutrient into the syrup along with the yeast? Thanks. My thought is, yeah the yeast would take off, but they would be getting attuned to corn sugar, not wort, and that is not a good thing. It is a risk, could hose your batch.